Hiking and Hitting a Mental "Trail Block"
Have you even been hiking and hit a “trail block”? You know the same thing as hitting that mental wall or a preverbal bump in the road? I had never experienced it until I hiked San Bernardino Peak. The plan to hike San Bernardino had been in the works for a couple weeks. I knew I had it planned and I was super excited to FINALLY get up on that peak! I’ve hiked longer distance trails and hiked in almost the same elevation with no problems, piece of cake. I was ready! I had hiked San Mateo Peak the day before and it was extremely hot and I ended up getting a headache after getting home so I knew I needed to just take some meds, keep hydrating and rest up for the next day because it San Bernardino Peak Sunday. One of my friends even texted saying she was going to back out because she wasn’t feeling too confident because she had recently started a new diet regimen and was concerned about her salt intake and energy levels and we convinced her to go and that she could do it and she decided to stick with the plan and go. Was that a sign? Did that psych me out that she was wavering on not going? Alas, I went to bed, mind full of nonsense. Sunday morning I woke up very early after not sleeping well. I got ready and headed out to meet my friends for the hike. As we started the hike, I felt ok. I knew I was hydrated, I had taken some Tylenol as a precaution, packed ample snacks and electrolytes and I had my “this peak is my beatch” mentality going on strong. The first few miles went good. I noticed I was a bit slower than my normal pace but I just kept going and told myself and my hiking gal pals “slow and steady wins the race”. I was slow and steady the rest of the way. And boy did it feel like it was never-ending. The trail is beautiful, far more than I had thought it would be, but I felt like the trail was NEVER GOING TO END and that I was NEVER GOING TO SUMMIT. That is when I knew I had hit the mental “trail block”. I was beyond slow, dragging my poles and my stride was like a shuffle. My go get em’ attitude of “slow and steady, we got this, we are almost there” turned into “OMG, I don’t think I can make it, I am going to have to turn around”. Heather who I was also hiking with kept encouraging me and honestly, had she not been there, I would have turned around. We continued to climb as we had been hiking about 5 hours at this point. Every person or group that passed us I would ask “how much further” Everyone had a different answer and the difference was miles! I thought again to myself “omg, this is never going to end”. At about 1 mile from the summit, I really thought I was going to have to turn around. I felt so defeated, I had never had that feeling before and it was taking its toll on me. I shed a tear, stopped and sat on a rock and told myself to get up and finish because I am not doing this again, lol. I slowly made it closer to the summit and then I saw my friend Brandi and the other girls and I knew I was there! I was so freaking happy. We stayed at the summit for about 40 minutes, ate, regrouped and started our decent back to the parking lot. I felt this sudden burst of energy and my upbeat attitude was back! I laughed going down the trail and me and Heather were talking about how defeated we had felt on the way up and how much merrier we were on the way down and we laughed some more. We made it through the first 4 miles of the decent without any issues but the last 4 were once again, tough. My feet were mad at me and I was tired. Heathers feet were mad at her too. I popped in my ear buds and kept on truckin. We hiked at a pace that was comfortable for us and guess what, we got to the end. We survived the never-ending trail. Even being discouraged and feeling defeated, I saw the beauty in the trail that I am proud to say that I finished. Talking with friends after the hike about hitting that mental trail block really helped since it wasn’t something I had experienced before. Now, speaking from experience, I can say that you can get through it. Do what you need to do for you. Listen to music, hum a tune to yourself, bust a couple dance moves along the trail (all things I did) and just know you and that you are capable of doing what seems hard. You are a beast and you got this. Joy is the Ambassador for our Inland Empire chapter. 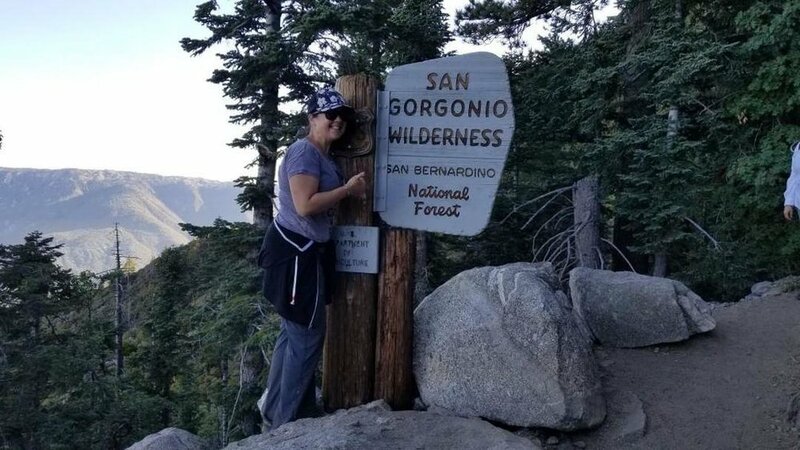 You can join her local meet ups and discussions through Girls Who Hike Inland Empire by clicking here.